Heat a large skillet over high. Add 2 tbsp. (4 tbsp. for 4 servings) oil. Add cabbage and saute for 5 minutes, stirring occasionally. Wash, peel, and grate granny smith apple. Place in a small bowl and toss with apple cider vinegar and sugar. Add onion to the skillet and continue to saute for another 3-5 minutes. Season with salt. Drain and pat turkey breast dry using paper towel. Season turkey well with salt and pepper on both sides. Empty flour onto a plate and season lightly with salt and pepper. Dredge the turkey in the seasoned flour, coating all sides. Drain and rinse brown lentils using a sieve. Wash and chop Italian parsley. Add garlic and caraway seed to the skillet and saute for one minute. Add apple mixture, grainy mustard, lentils, and a pinch of cayenne pepper to taste. Reduce heat to low, cover with a lid and let simmer for 15 minutes. Heat a second large skillet over medium-high. Add 2 tbsp. (4 tbsp. for 4 servings) oil. Carefully place turkey breast into hot oil and fry for 3 to 5 minutes per side until crispy and golden on the outside and cooked to an internal temperature of 165ºF. Divide braised lentils and cabbage into large bowls. 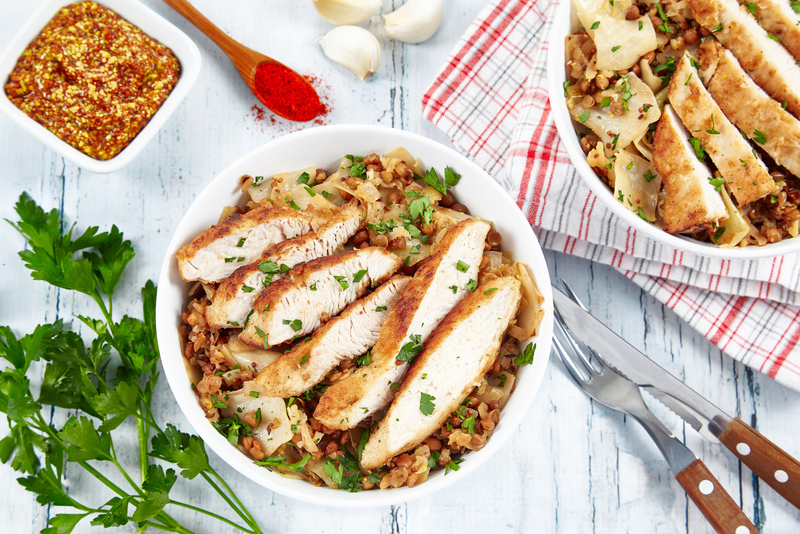 Slice turkey breast and place on top of cabbage and lentils. Garnish with chopped parsley. Enjoy!